This is an In Person signed Colour Photo 12" x 8" by the Welsh jockey on Earth Summit the horse he won the Grand National on in 1998. 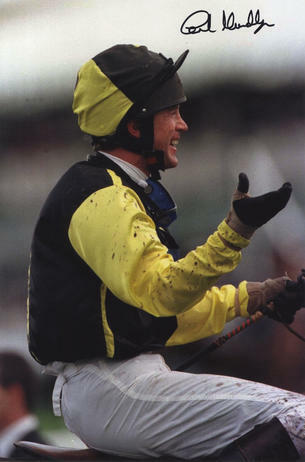 The 1998 Grand National (known as the Martell Grand National for sponsorship reasons) was the 151st official renewal of the world-famous Grand National steeplechase that took place at Aintree near Liverpool, England, on 4 April 1998. The race was won in a time of 10 minutes and 51.5 seconds and by a distance of 11 lengths by the 7/1 favourite Earth Summit, ridden by jockey Carl Llewellyn. The winner was trained by Nigel Twiston-Davies at Grange Hill Farm in Naunton, Gloucestershire, and ran in the colours of the six-member Summit Partnership, which included Aintree press officer Nigel Payne and former Hereford United footballer Ricky George. Thirty-seven runners took part and six completed the course without mishap, but three horses were fatally injured during the race. The main race was seen by the smallest Grand National attendance at Aintree since 1985, with a crowd of just 46,679, over 11,000 less than two years prior. It came a year after the 1997 Grand National had to be postponed due to a bomb threat.